While listening again to the recorded lectures from Scott Powell's European history course on the way into work this morning, I heard something that made me burst into song and then into laughter. In 1294, during a period of crisis in the papacy, Pope Boniface VIII came to power after the abdication of Celestine V. He later had Celestine imprisoned, and began clashing with the very powerful king of France, Phillip IV. His actions cast a cloud over his papal reign. 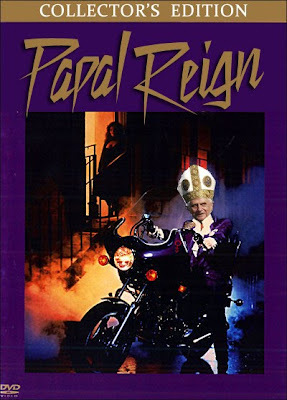 Talk of popes always puts me on the edge of laughter anyway because it is such an absurd institution. And for those playing at home, Phillip IV eventually had Boniface kidnapped, then installed his own pope who up and moved the papal seat to Avignon in France. (Châteauneuf-du-Pape, anyone? It's delicious.) And later there were antipopes and anti-antipopes. Hilarious. Do you think if you got the pope and antipope together in the same room, the universe would collapse in on itself? First, this is on my short list for post of the year! Hilarious. Second, in answer to your question, I would say that since Pope's can neither be created nor destroyed, they would simply transform to pure energy except their giant white hats would not be affected due to the "giant white hat invariance" principle. And I completely neglected to account for the GWHIP in my calculations. Thanks for the correction. The post and comments are both hilarious! PS - I'm reading "Hamilton's Curse" now about the constitutional convention and Hamilton's activities to subvert liberty in favor of a tyrannical government working for the interests of bankers in NYC. I'll post a book review of it on my blog with some commentary about how we went from freedom (1776) to Fascism (1789) because of the Federalists. Thanks. With all the depressing stuff to think/debate about right now (like the accelerating ways the government is managing to ruin our lives), I needed a good laugh. The GWHIP especially.